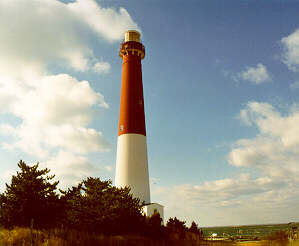 Barnegat Lighthouse, affectionately known as "Barney" or "Old Barney" is the quintessential symbol of the Jersey Shore, so much so that it's image is on special New Jersey license plates. The original lighthouse was constructed in 1834, but toppled into the sea due to storm erosion in 1856. The current structure was built in 1858. The red and white tower is 165 feet tall, and includes 217 steps to the top. The lighthouse was first lit on January 1,1859 and was retired in 1927. When operational, the light could be seen from as far as 30 miles. The interior of the lighthouse is open to the public from 9am to 4:30 pm, giving visitors a spectacular view. During the summer, the lighthouse is open on selected evenings until 9:30 pm. 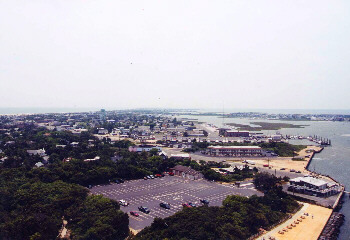 Photo on the left looks south at Long Beach Island. 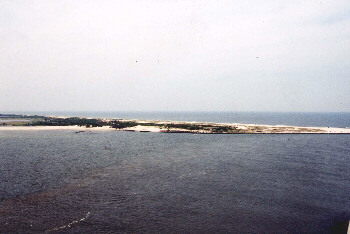 Photo on right looking north at Island Beach State Park.